The long range forecast looks terrific for sap flow! Let the maple syrup season begin! After four days of de minimus flow, the cold weather descended on our region and dropped 7" of heavy snow. This will add further moisture and insulate the ground, which often prolongs the maple syrup season. The frost depth is 26" at the Chanhassen Weather Center (7 miles away), so the largest flows will arrive as the frost dissipates. 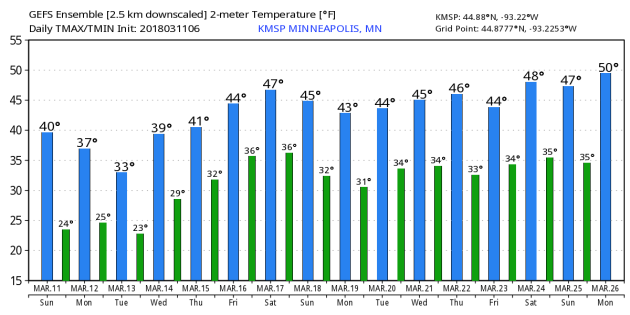 Next week a warmup arrives, and hopefully, will deliver our first significant sap flows. Sap Flow Returns to Somerskogen! Temperatures climbed into the mid-40's by noon on February 27th. As the new releaser and fittings were assembled deep in the woods at our collection tank, we observed the first sap flow of the season. This is a full two weeks later than the 2017 season, but more typical of our average start. The flow was insufficient to even consider processing, but enough to declare "game on" for the new syrup season. The weather looks very favorable for this next next week. We anticipate making syrup in the next few days, but Mother Nature always rules.